For our RPC submission, we created a section of the skin and floors of our building. 3D view of skin. The skin is populated with a variable custom panel. The Curve|Line tool solves intersection events for a curve and a line. I used the Curve|Line tool to turn the intersections between a curve and a line into cones. I started by imputing my curve and line into grasshopper. I attached the curve and line to the CLX (Curve|Line) function. I attached the output of the CLX to a circle, whose diameter I controlled with a slider. I then linked the circle output with the base plane and radius of a cone and controlled the height of the cone with a slider. This resulted in multiple cones that were based on the original intersection points between the curve and the line. 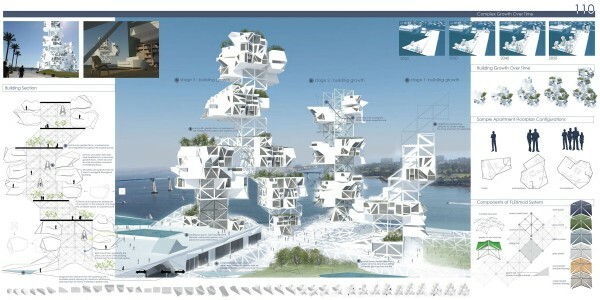 The FLEXmod Skyscraper was designed by Nick Ochoa, Sabrina Brenner and Michael Krause for the eVolo 2011 Skyscraper Competition. It is a system that starts with a central frame that includes vertical movement corridors and lobby space that supports modular residential units. The units can be added on to or subtracted from in order to meet the need of the residents, and roofs of the units are used as common green areas for the building. The designers intended the buildings to conserve resources by only using materials for the units that are in use. If there is a decrease in the amount of program space needed, the units can be removed and stored efficiently until they can be used again. This concept intrigued me because of the flexibility the modules bring to the design while not looking like simple building blocks stacked on top of one another, as many modular designs do. I believe that coming up with strategies to be able to change the program of a building is something that is useful now and will still be useful in the future. Because of this, I would be interested in exploring modularity in my design for a building this quarter.